by Brianna Crandall — January 15, 2018 — IC Realtime, a provider of digital surveillance and security technology, introduced Ella, a new cloud-based deep-learning search engine that augments surveillance systems with natural language search capabilities across recorded video footage, at last week’s CES 2018 technology show. Ella is a new cloud-based deep-learning search engine that augments surveillance systems with natural language search capabilities across recorded video footage. Ella uses both algorithmic and deep learning tools to give any surveillance or security camera the ability to recognize objects, colors, people, vehicles, animals and more. Ella was designed with the technology backbone of Camio, a startup founded by ex-Googlers who realized there could be a way to apply search to streaming video feeds. Ella is designed to make every nanosecond of video searchable instantly, letting users type in queries like “white truck” to find every relevant clip instead of searching through hours of footage. Ella quite simply creates a Google for video, says the company. The idea was born from a simple question: If we can search the entire Internet in under a second, why can’t we do the same with video feeds? IC Realtime is the perfect partner to bring this advanced video search capability to the global surveillance and security market because of their knowledge and experience with the needs of users in this space. Ella is the result of our partnership in fine-tuning the service for security applications. According to the company, the average surveillance camera sees less than two minutes of interesting video each day despite streaming and recording 24/7. On top of that, traditional systems only allow the user to search for events by date, time, and camera type, and to return very broad results that still require sifting, often taking hours of time. Ella instead does the work for users to highlight the interesting events and to enable fast searches of their surveillance and security footage for the events they want to see and share. From the moment Ella comes online and is connected, it begins learning and tagging objects the cameras sees. The deep learning engine lives in the cloud and comes preloaded with recognition of thousands of objects like makes and models of cars; within the first minute of being online, users can start to search their footage. Hardware-agnostic, Ella also solves the issue of limited bandwidth for any HD streaming camera or NVR. Rather than push every second of recorded video to the cloud, Ella features interest-based video compression. Based on machine learning algorithms that recognize patterns of motion in each camera scene to recognize what is interesting within each scene, Ella will only record in HD when it recognizes something important. By learning from what the system sees, Ella can reduce false positives by understanding that a tree swaying in the wind is not notable, while the arrival a delivery truck might be. Even the uninteresting events are still stored in a low-resolution time-lapse format, so they provide 24×7 continuous security coverage without using up valuable bandwidth. 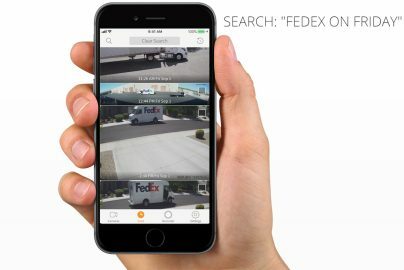 The video search capabilities delivered by Ella haven’t been feasible in the security and surveillance industry before today. This new solution brings intelligence and analytics to security cameras around the world; Ella is a hardware agnostic approach to cloud-based analytics that instantly moves any connected surveillance system into the future. Ella works with both existing do-it-yourself (DIY) and professionally installed surveillance and security cameras, and is comprised of an on-premise video gateway device and the cloud platform subscription. Ella subscription pricing starts at $6.99 per month and increases with storage and analysis features needed for the particular scope of each project. To learn more about Ella and watch an introductory video, visit the IC Realtime Web site.